Discussion in 'Wood / Woodwork / Carpentry' started by JohnArnoldBrown, 27 Mar 2007. Is it worth having 250mm TCT circular saw blades resharpened, or is it cheaper to just replace them? The blades in question are Freud, and cost around £35 each. Well I guess if it would cost that much in Canada it would be twice as much over here, but I don't want a cheaper blade, I really like the smooth cross-cut I get from this Freud LP40M. Probably cost about £15 without looking up how many teeth your blade has, will cut as good if not better once sharpened. If you are in my part of surrey try Delta Power tools in Warlingham, usually 7day turnaround as they don't do it themselves. Otherwise look for "Saw Doctors" in yel pages. Thanks, Jason. It has 60 teeth, and it's still cutting well, but I accidentally found a screw yesterday, which set me wondering about sharpening services. Have you thought of doing it yourself? All you need is a good flat file and a piece of wood to wedge the blade whilst you file each tooth. I do it and it works perfectly. PS just remember to unplug the saw before you start. None of you guys ever sharpened or set a saw. 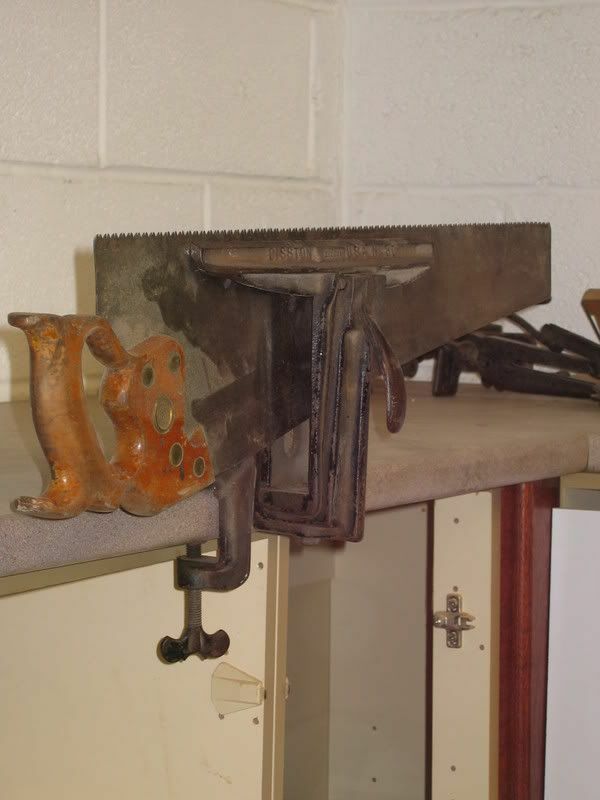 You will be telling me next that you send your hand saws away to be sharpened, or even worse you buy those throwaway type from B@Q.
and for your benefit that is a pre-WWII Disston in a Disston saw vice. The OP was asking about TCT circular saw blades, if you can tell us your method for hand sharpening them that would be great. Hey! Enough already! My question has already been answered comprehensively by Jasonb, whose opinion I respect(because I've seen those pictures of his work). Maybe anobium is thinking of high speed steel circular saw blades or something. To change the subject, I asked in another thread if anyone had an opinion about Tornado router bits from Rutlands, but didn't get much response. Surely someone must have tried them! Tend to stick with Wealden and the odd CMT bits. My apologies lads, I stand corrected, for some reason I missed the tct reference, but honest I do resharpen my high speed blades and they cut perfectly. Scrit when did you last use that saw, not recently I think, and the teeth, from what I can see look slightly uneven. Interesting saw vice but not as good as a wooden home made one which keeps all the blade rigid. That was taken just before I started to top and refile it. Every time I buy and old saw they're the same - badly out. As to rigidity - you just move the blade along a bit when you need to. Saw horse or work bench for circular saw? Cutting 70mm hardwood in two with circular saw? Cutting circular holes without central drill bit. Sharpening Machine - how do i use? ?